The Bit.Trip titles are some of my favorite games of this console generation. Sadly, the series still hasn't truly found its audience. Sure, the games have a huge following, but I'm certain that the Bit.Trip series has what it takes to go beyond Katamari Damacy-level popularity to full-on blockbuster status. The problem is that so much of what makes the series amazing can't be conveyed with screenshots and videos. 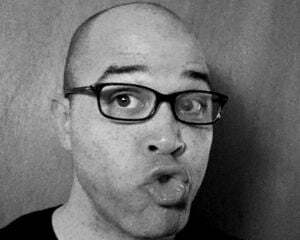 This is a series where gameplay is the true star of the show, something that's becoming more and more of a rarity in today's motion-capture-focused, Hollywood-chasing games industry. Sure the Bit.Trip series has incredible art direction and one of the most infectious, rhythm-focused soundtracks in recent memory, but it's the way that the series seamlessly fuses every aspect of the game into the overall experience that makes it all work. The way the game plays expresses ideas that carry over into the visuals, and those ideas are wholly unified with how the game sounds, with the sound coming full circle and informing how the game plays. Both a love letter to videogames and a bold experiment in gameplay as storytelling, the Bit.Trip series is a unique, expertly crafted force in gaming today. I'm hoping that more people will find out for themselves how amazing Bit.Trip is now that all the games in the series have been compiled for the 3DS and Wii at retail. 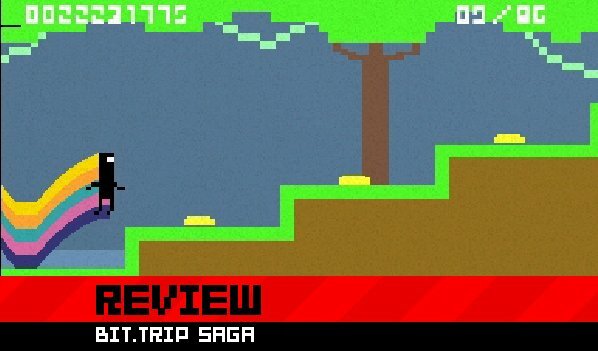 Like the title says, this review is for the 3DS-specific compilation, Bit.Trip SAGA. So without further ado, let's get cracking! 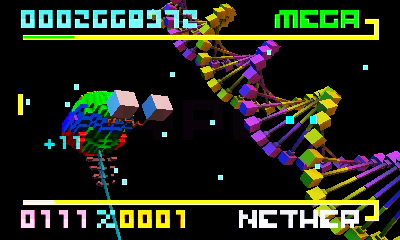 First off, check out the reviews for each indivigual game in the series (Bit.Trip BEAT, Bit.Trip CORE, Bit.Trip VOID, Bit.Trip RUNNER, Bit.Trip FATE, and Bit.Trip FLUX) for a real look at what makes this compilation amazing. Though I'm tempted to re-review each and every game in the series, that probably would just end up hurting your brain, and causing my hands to die after writing the at least 80 paragraphs necessary to do each game in the series justice. Instead, I'll be as brief as I can. if you like Guitar Hero, Rhythm Heaven, and/or Parappa the Rapper, you need to try this series out. If you like any games from the Atari 2600 era, you need to play this series. 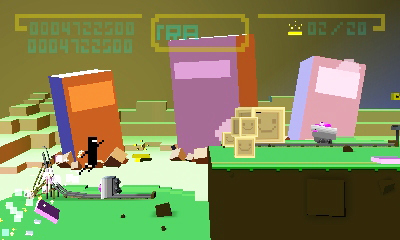 If you like Vib Ribbon, Rez, Child of Eden, or Super Meat Boy, you need to play this series. If you like good videogames, you need to play this series. OK, now that we're done with all that, let's get to the specific traits of this 3DS compilation. The first thing I thought when I heard that the whole Bit.Trip series was coming to the 3DS was, "How are they going to play?" As I've previously gushed, the details around the way each game in the Bit.Trip series plays are extremely important to the overall experience. That's why I had to dock the iPhone version of Bit.Trip BEAT a few points (more like a fraction of a point, but whatever). The controls got in the way of the experience, which is the polar opposite of what the Bit.Trip series is about. Thankfully, the controls for each game in Bit.Trip SAGA are just as engrossing and intuitive as they were in their original WiiWare releases. In fact, I imagine that some will even prefer the controls of some of the games here, particularly Bit.Trip BEAT, FATE, and FLUX. Using the stylus and the touch screen to control the action on the 3DS's top screen works just as well as the pointer- and motion-based controls from the Wii games, while requiring more in the way of fine motor skills, and less physical dexterity among larger muscle groups. Thankfully, the stylus controls don't provide a clear advantage, and therefore don't diminish the challenge of either game. Before I forget, you can also use the analog nub to control BEAT and FLUX. People who really crave conventional controls may love that, but I wasn't into it. It's a well-implemented but inherently inferior control scheme. One more note: the challenge power-down is impossible in Bit.Trip CORE now. No more cheating by turning your Wii remote on its side. It's totally brutal. The other big new feature here is the graphics. Of course, the games are presented with glasses-free 3D, and it looks great. 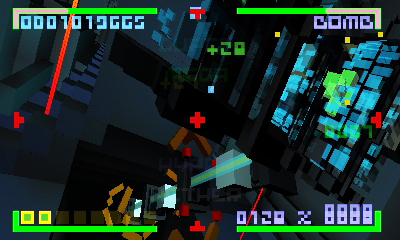 Personally, I found that the 3D effect looked best on the more simple games, like BEAT, CORE, VOID, and FLUX. That's not to say that these games have less complex visuals. 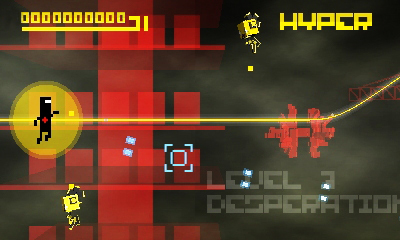 FLUX is probably the most visually robust game in the series, which is saying a lot. Some of the backgrounds there could give Child of Eden a run for its money. They are totally mind-blowing, especially in 3D. No, the reason that the 3D seemed to work best for these games is that for the most part, they only apply the 3D feature to large geometric shapes. The 3D seems to get a little borked when very small objects are engaged in very fast animations. This happens a little bit in FATE, but it's a constant issue with RUNNER, and I'm not sure if there is anything that could be done about it. Glasses-free 3D works by displaying two images on-screen at once; one seen by your left eye, and one is seen by your right. That causes the screen as a whole to be a little faded, and with small, fast moving objects, potentially a little blurry. Also, when you turn the 3D slider on in RUNNER, it mysteriously moves the player character forward a little bit on the screen. That doesn't really affect the gameplay, but it is a fun little detail that may surprise fans of the original (or not, as I just told you about it). In fact, there are tons of little changes like that to be found in every game in Bit.Trip SAGA. All the titles here needed to be recreated from the ground up, and Gaijin Games took the opportunity to tweak the visuals here and there, while taking advantage of some of the console's superior power, such as the 3DS's capacity for per-pixel lighting. These little changes can be found in every game. The fog effects in CORE are gone now, which allows you to get a much closer look at the game's intricate backgrounds (which again, look amazing in 3D). FATE has some new animations, and the majority of the enemies now have a glossy, new car-sheen. 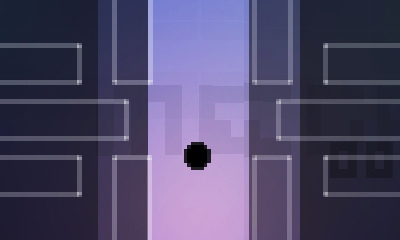 VOID has some alternate color schemes and some new background graphics, FLUX appears to have brighter, more saturated colors, and tons of new little details. 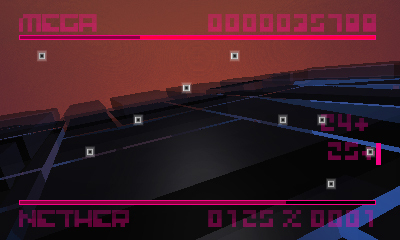 The sky in the first stage of RUNNER is now more blue than purple. The list of changes, both big and small, goes on and on. Some of these changes are clear improvements, and some of them are just differences, but they are all worth checking out for true Bit.Trip fanatics. If you're like me and you insisted on owning the PS1 version of Resident Evil and the weird, hard-to-find Sega Satrun version that utilizes all-new art assets, then you know what I'm talking about. Sadly, it's not all good news for SAGA. The multiplayer options are completely gone, which is a major blow. Five out of the original six games had multiplayer in the first place, so those of you buying this collection just for RUNNER probably won't notice, but as someone who's hooked many a skeptic into the Bit.Trip series by tempting them with some four-player BEAT sessions or two-player CORE and VOID run-throughs, the loss of multiplayer is tremendously disappointing. It's also worth noting that releasing this game next to Bit.Trip Complete on the Wii for the same price as SAGA is extremely respectful to the consumer, but does a world of hurt to SAGA's desirability. Complete has so much in the way of new content that it's insane. SAGA is still an incredible package -- with portability and new, improved 3D-enabled visuals being must-have features for some -- but it still hurts to see SAGA go without some of the greatness we get with Complete (but I'll save that for the Bit.Trip Complete review). Comparisons aside, Bit.Trip SAGA stands alone as a visually enhanced, portable repackaging of some of the best games of this generation of consoles. Just like Paris, Bit.Trip SAGA is for lovers.